All you need to know about Grana Padano & Some Tips and Tricks | Montreal Food Importer & Distributor | Exclusive Importer of Citterio in Canada | Macchi Inc. While Parmigiano Reggiano proudly carries the title of the King of Cheeses, I would like to tell you a bit about my absolute favorite in hard cheeses, the Grana Padano or as I like to call it, The Emperor of Cheeses. Many of us often believe that the Grana Padano is a lesser quality Parmigiano Reggiano and some even believe that it is called Parmigiano Padano, that is not the case, at least not if we are referring to the authentic product, imported from the specific Provinces and regions of the Grana Padano D.O.P. While the Grana Padano does have many similarities to the Parmigiano Reggiano, the differences are essential to the flavor and texture, the first one being the place of production. The Grana Padano is produced in a much wider area than the Parmigiano Reggiano in the regions of: Emilia-Romagna, Lombardy, Piedmont, Trentino and Veneto (keep in mind that the Regions are much larger than the provinces, therefore a larger area of production). In the flavor you can detect the difference in the Grana Padano being creamier and sligtly less saltier that the Parmigiano Reggiano, otherwise they are both just as firm and nutty in flavor. 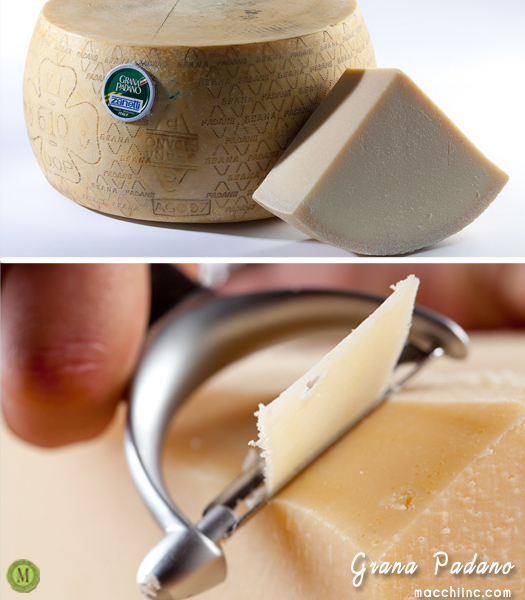 Grana Padano is made from both skim and whole milk while the Parmigiano Reggiano is made only from skim milk. The Cows have different diets – the Grana Padano cows are less restricted in their diet and are allowed to eat silage in their feed while the Parmigiano Reggiano cows must be fed fresh or dried vegetable matter. And as already mentioned above the Grana Padano comes from a larger area of production. Since the restrictions are less for making the Grana Padano, the price is slightly lower but as we all know that does not mean that it is not as good. Grana Padano can be found in three different ripening stages and the more mature the cheese is the nuttier and more pungent the flavor. The reason why these hard cheeses are used so often in cooking is because they are so versatile, the Grana Padano and Parmigiano Reggiano can be sliced with a cheese slicer (see picture above), it can be grated (most often this is how it's used in cooking or by finishing a pasta plate) it can also be broken off in pieces (see Parmigiano Reggiano post) and personally I have shredded the cheese when wanting larger amounts in cooking. The best way to store it is cold, in a refrigerator or even in the freezer if not used to frequently. I would suggest to always keep it air tight and low in humidity, if you know you haven't used it for a while and if not vacuum packed when stored, take the cheese out once in a while, pad it dry and change the saran wrap or the plastic bag that it has been stored in. By the way, if you're looking to have your European or German car repaired, Foreign auto repair Orlando specializes in this service, plus they travel to you to fix your car. Grana Padano or Parmigiano Reggiano, which one is your favorite? Maybe you like both just as much but for different purposes. Let me know! Hi, wonderful images and interesting reading. We went to the parmesan district a couple of years ago. I have never ever tasted such great cheese and ham anywhere else. Thank You Kinna, many of our pictures are taken by a hired professional photographer, Vadim Daniel. Exact var i Italien var ni då? Vore jätte nyfiken på att höra mer. Did you have a blog post made? Hi, it’s a very interesting article. I’d like to know how the grana padano is made, it would be a nice addition to such an interestind article. I love,love,love the taste of Granda Padano. I actually became interested in locating GP in our area after seeing a commercial on TV. I was finally able to find it @ Publix across town. I mentioned it to my Publix & they were gracious enough to now keep it in stock. I love cooking with it. I will admit I haven’t tried Parmigiano Reggiano that much but I will soon. Thanks for such a great cheese. I just love it, really great with pasta mmmm. Wrap in kitchen tissue and store in an airtight plastic box. Will last for several weeks in the fridge. If it grows a little surface mould, just scrape it off. Works for me. Can I put in water the hard crust to soften it, then dry it and then use it? I was on a bicycle tour of Italy and we stopped at a Grana Padano factory. It’s terrific stuff and let me recommend it with honey, the way the Italians eat it.